Rob Roy is a clean climb on slick rock, with many tricky slab sections. Unfortunately, it is too runout for most people; if leading, the belayer should do a careful job spotting the leader until they get to the first bolt. 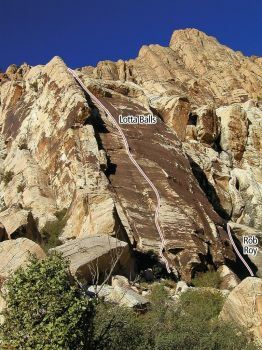 You can toprope this climb with two ropes by climbing the Friendship Route. Which SuperTopo guidebooks include a topo for Rob Roy?